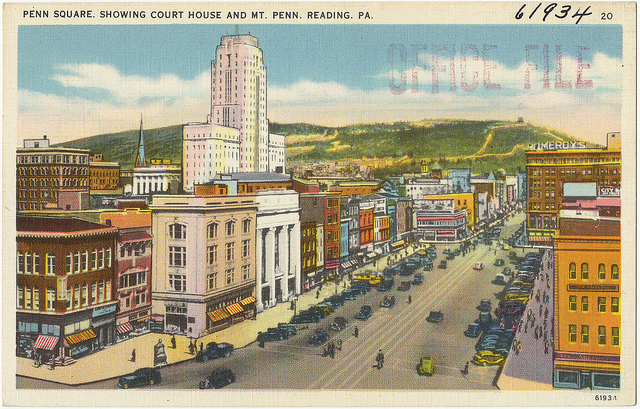 In the area of Reading, Pennsylvania that is now bordered by Oley, Douglass, Front and Weiser Streets, there used to be a magical place called “Paradise Peach Grove.” Today, this is very much an urban neighborhood with many homes, stores and even a gastropub. But in the mid-1800s, this area was considered “way out in the country,” according to George M. Meiser IX’s The Passing Scene, a series of books on the history of Berks County. 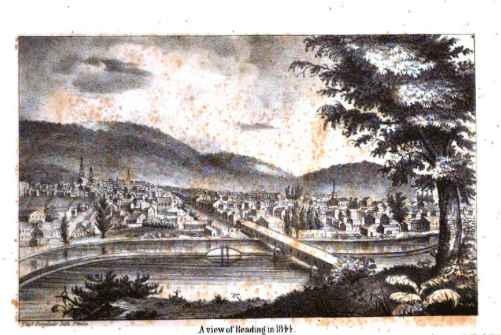 The city of Reading in 1844. From “History of the Counties of Berks and Lebanon” via Google Books. Around 1850, someone who ventured out of the metropolis and into the countryside would have glimpsed a tall fence. Inside, the traveler would have discovered a five-acre peach grove with over two thousand peach trees of “the finest varieties known to peach culture” at the time, says The Passing Scene. In the center of the “Paradise” was a little bungalow the orchard’s owner, William B. Schoener, built so that whenever he had free time away from his law practice, he could pass his leisure hours there. He enjoyed the beauty and quiet of the peach grove and the fragrance of the fruit wafting on the breeze. Image credit: “The Fruits of America” via Internet Archive Book Images. Schoener wasn’t the only one who enjoyed the setting. His “many friends considered it a treat to be invited to spend an afternoon with him there,” says The Passing Scene. When the orchard was in bloom, people from the city flocked to Paradise Peach Grove “to see the pretty sight.” Schoener sold the peaches in the city of Reading, where his were considered the very best, and many people visited the little orchard during the harvest. 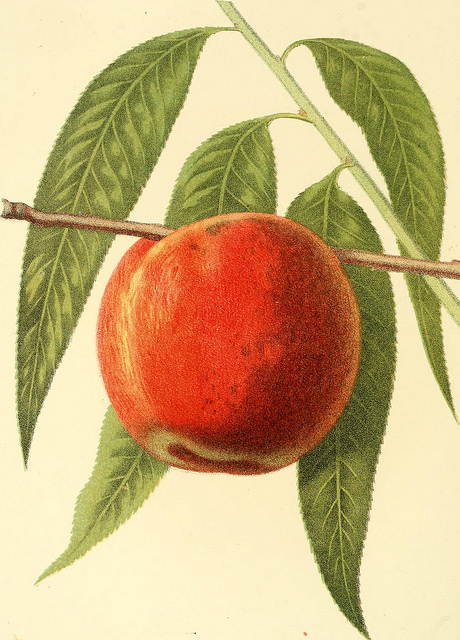 Peaches were not the first fruit trees William B. Schoener planted. In 1832, he planted several thousand trees that were not meant to entice or feed his neighbors, but to satisfy the voracious appetites of worms. Image credit: “The American Entomologist” via Internet Archive Book Images. During the 1830s, Americans scrambled to plant mulberry trees–a hungry silkworm’s preferred delicacy. Prominent leaders like John Quincy Adams claimed that silk production would make ordinary people rich. Americans started reading government-sponsored manuals and attending silk conventions in droves. Schoener followed suit. In 1832, he planted several thousand mulberry trees on his Reading property, where he raised and sold the trees and even the silkworms themselves. He also manufactured and sold silk-spinning machinery. All this brought him $10,000 in just five years (over a quarter of a million dollars today). However, Americans’ silkworm craze ended after an especially cold winter killed many mulberry trees in 1839, ruining the big investments and bursting the speculative bubble. Many speculators and even farmers ripped up their remaining mulberry trees in frustration, but Schoener simply let his grow wild until they were cut down in 1882. Even in Schoener’s peach paradise, a few mulberry trees mingled with the peach trees. What happened to the “shady walks and bowers” of this fruit-tree retreat on the outskirts of Reading? The story goes that shortly after Schoener was elected as a Reading alderman in 1851, he received word that neighborhood kids had broken into the orchard, damaging the fence and a number of trees. This wasn’t the first time the orchard had suffered that fate, and Schoener grew frustrated and announced right then and there that he would sell the whole place. Word got around that Schoener was selling, and the developer James Jameson snatched it up. Oddly enough, the developer himself had lost money during the silk worm craze, but he more than made up for it through his real estate ventures in the rapidly expanding city of Reading. About a eighty years later, in the 1930s, Daniel Weaver began loading up a truck at Weaver’s Orchard and bringing his produce into the center of the thriving city to sell on street corners. Reading no longer had an orchard of its own, but people like Daniel Weaver brought the orchard to the city. Image credit: Boston Public Library via Creative Commons. Reading circa 1930-1945. 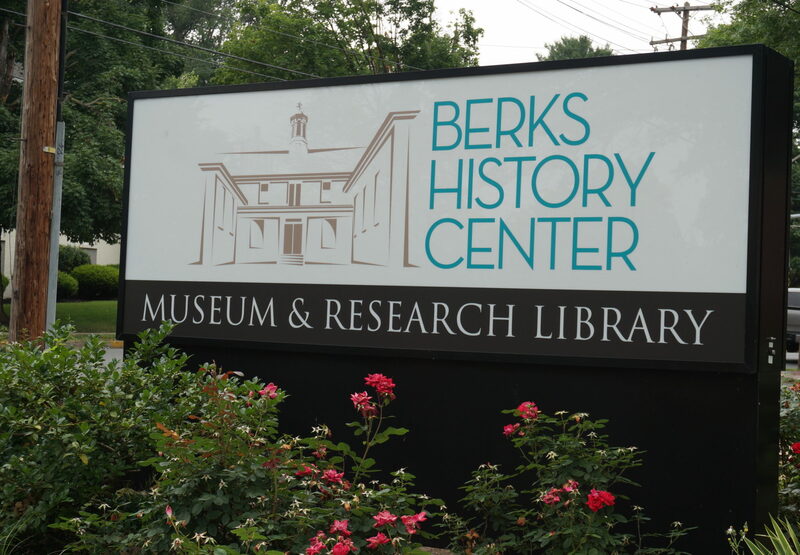 I learned about Reading’s forgotten peach orchard at the Berks History Center’s Research Library. While there, I also paged through their collection of historic Pennsylvania cookbooks. The oldest I could find was kept by Lizzie S. Scott, whose ancestor William Mannerback settled in Reading about 1785 to work as a silversmith, according to the pamphlet The Mannerbacks: Reading’s Master Silversmiths. Scott started her cookbook in 1887, around the time all of William B. Schoener’s mulberry trees were being cut down. Here is her recipe for Spiced Peaches, transcribed from her handwritten notes. I modified it slightly to make the recipe easier to follow since Scott’s recipes are very much an experienced cook’s notes to herself. To prepare the peaches, you will want to blanch them so that you can remove the skin more easily. Peaches are currently available in the Weaver’s Orchard market and will be ready for pick-your-own on August 4. 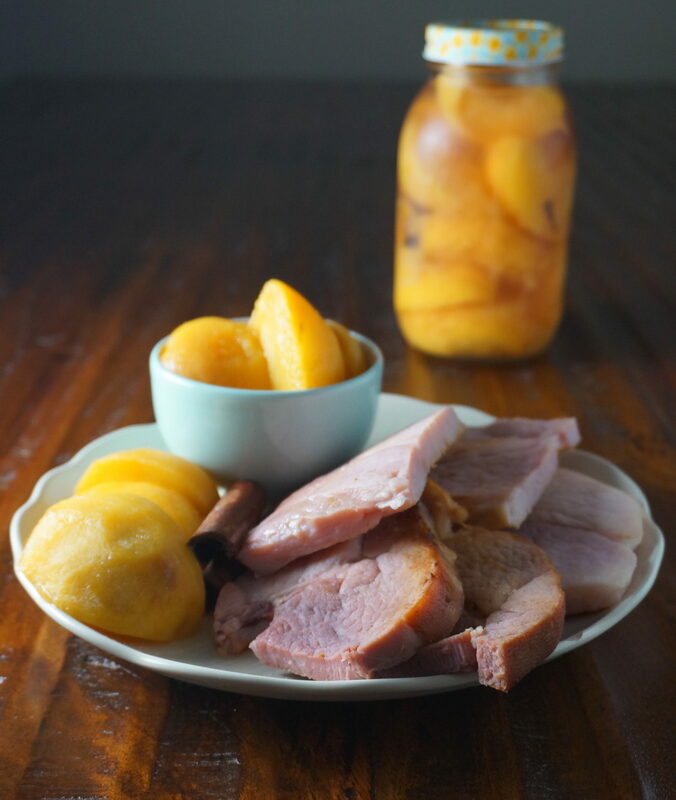 Nectarines are available now and would also be delicious in this recipe! Transcribed from handwritten notes in Cookbook of Lizzie S. Scott, 1887, from the Berks County History Center archives. Modifications have been noted with brackets. To seven lbs of fruit [add] 3 lbs of sugar. Melt [dissolve] with half pint of water, let your fruit come to a boil. Add cinnamon, cloves and tea cup of vinegar [1 cup].